Listed below are several products that we support and they support us through you. Each of these companies have been proven all natural producing companies that we have used over the years with our own families. We hope you find them as beneficial as we have with better nutrition, care and quality of life from using these products. 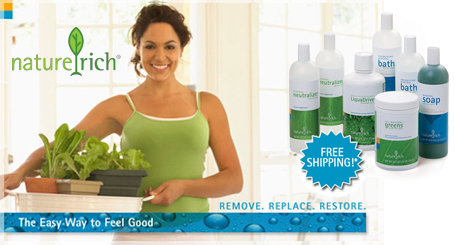 Nature rich has many nutritional products from their Mineral Neutralizer and All-Natural Greens to better personal care like Soaps and Skin Moisturizers.